With five beers launched in March, it was always going to be hard to top it in April. That's why we're kicking things off at the brew pub with the Showstopper. A New South Wales grown and brewed beer, released especially for the Sydney Royal Easter Show. Having competed in the Sydney Royal Easter Beer & Cider competition since 2014 we understand it's significance. The Royal Easter Show is an opportunity to exhibit quality produce from specific areas and be judged against the best. 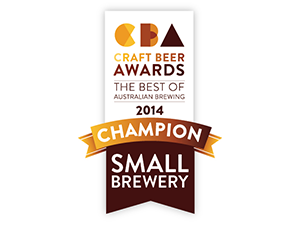 We're still proud that last year we took out the title for Best NSW Beer with Former Tenant Red IPA. The Showstopper is a crisp, refreshing pale. Brewed with malted barley from the growers in Forbes Western NSW and fresh Cascade hops from Ryfield Hops in Bemboka close to the NSW border. At 3.9% ABV it’s easy drinking craft beer that will appeal to a wide audience. With the Easter Show now over we have managed to squirrel away a few kegs that will only be available at the brewpub with a very limited release from Friday 6th April. With a cheeky sneak preview of our Vanilla Mocha Stout at the Good Beer Week Gala Showcase, we can't wait to launch it proper. The feedback by the few that tried it has been great and we're working on the launch as we speak. It will be a Victoria only release, in kegs and cans just ahead of the Good Beer Week events. We will post a seperate release purely on our goings on. As the official brewery of the festival, we'll be turning up at Beer Deluxe and a Pint of Origin. We've been working on getting some merch ready for the festival that will be celebrating the Vanilla Mocha Stout. Another National release. Expect a new Limited Release from us at the end of April. We're going to squeeze in something exciting before the weather turns too cold. Watch this space.